This article first appeared in The Edge Financial Daily, on April 18, 2018. KAJANG: Malaysia recorded the highest-ever number of unsold completed residential properties last year, totalling 24,738 units — a 67.2% year-on-year (y-o-y) increase compared with that in 2016. At the same time, the value of these overhang units jumped 82.8% y-o-y to RM15.64 billion in 2017, the Valuation and Property Services Department (JPPH) under the finance ministry unveiled yesterday. 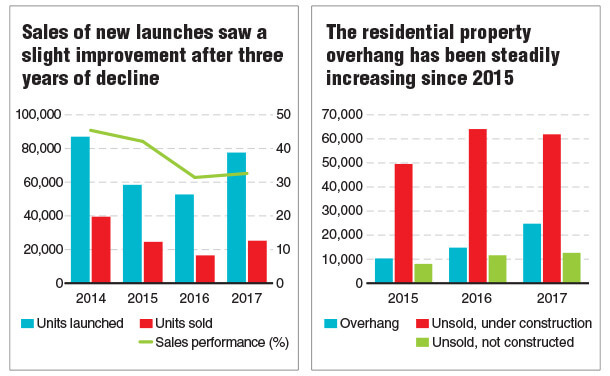 The department defines overhang as unsold completed units that have been in the market for more than nine months after launch. JPPH said the indefinite freeze on the development of luxury properties worth more than RM1 million per unit in major cities is to curb the residential supply overhang. Besides the ban on high-end residential projects, the department has launched the Unsold Property Enquiry System Malaysia (UPESM) digital platform, providing information on unsold units’ locations. “Users can use the search function on UPESM and find out the number of unsold units by state, local council and type of property. With the system, property developers and the government would be able to leverage on the information provided to make informed decisions on future projects or policies,” JPPH director-general Nordin Daharom told a press conference after the launch of the 2017 Property Market Report. He said JPPH will also be collaborating with other government agencies such as the Department of National Housing, the Department of Local Government, the Inland Revenue Board and the Department of the Director General Land and Mines to compile data on the property market. While the overhang saw an increase, Nordin pointed out that unsold units under construction fell 3.4% to 61,882 units in 2017, led by Johor and Selangor, each accounting for 18.2% and 18% respectively of total units nationwide. He added that the property sector is starting to see a recovery amid a more positive sentiment among developers, considering new launches increased 47% y-o-y to 77,570 units, with 32.6% of units sold. By state, Kuala Lumpur saw the most launches with 22,000 units, albeit with low sales performance of 19.5%, followed by Selangor (13,522 units with 45% sales performance) and Johor (7,926 units with 44% sales performance). Most of these launches comprise two- or three-storey terrace houses priced between RM500,000 and RM1 million. Meanwhile, the overall Malaysian property sector saw a fall in the number and value of property transactions in 2017. Y-o-y, the number of transactions fell 2.7% to 311,824, while the total value of transactions declined 3.8% to RM139.84 billion. Residential properties remained the driver of the local market, accounting for 62.4% of the market as at end-2017. The residential segment saw a 4.1% decline in the number of transactions, while the value of transactions increased 4.4% to RM68.47 billion. JPPH said demand was largely focused on properties costing RM200,000 and below, accounting for about 45% of residential market volume. House prices continued to see a steady increase, with the Malaysian House Price Index up 6.5% y-o-y to 187.4 points, led by Selangor and Kuala Lumpur where prices grew 7.6% and 7.3% respectively. Meanwhile, the commercial property segment continued to decline in 2017, with the volume of transactions falling 6.7% y-o-y to 22,162 units, while the value fell 29.2% y-o-y to RM25.44 billion. The department said the retail sub-segment remained stable, with an average occupancy rate of 81.3% in 2017, versus 81.4% in 2016. “The retail market is still a bit challenging due to changing shopping trends, where consumers are no longer into traditional shopping. So, retailers have to encompass digital shopping trends into their way of doing business,” said Nordin. The purpose-built office buildings sub-segment saw a slight improvement in occupancy to 83.3% last year, compared with 82.3% in the previous year.